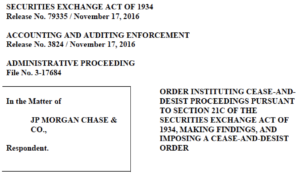 The SEC charged JPMorgan Chase & Co. (“JPMorgan”), with engaging in a systemic FCPA (Foreign Corrupt Practices Act) scheme. The SEC’s Administrative Order stated that JPMorgan, through JPMorgan Securities (Asia Pacific) Limited, conducted a client referral hiring program that provided non-competitive jobs to relatives and friends of senior officials, so that JPMorgan could leverage these positions to obtain or retain banking business. The SEC charged that in doing so, JPMorgan violated the anti-bribery, books and records, and internal controls provisions of the FCPA. That program was created to enable certain candidates, known as “referral hires”, to bypass the firm’s standard hiring process. It was exclusive to candidates referred by existing clients, prospective clients, or foreign government officials. Those candidates did not participate in the normal hiring process. The majority of those candidates were less qualified than candidates hired through JPMorgan’s traditional, competitive hiring program. According to the SEC, “referral hires” were given jobs based on the direct or potential influence that their hiring might have on the banking revenue that JPMorgan expected to garner from the referring client. The length and quality of the job offered was directly linked to the amount of potential revenue or the amount of profits expected. JPMorgan allegedly conducted its FCPA employment scheme for roughly seven years, between 2006 and 2013. During that time, the firm hired approximately 200 interns and full-time employees through the program. Of those hired, almost 100 of them were referred by foreign government officials at twenty different Chinese state owned entities. In turn, those Chinese state owned entities engaged JPMorgan on transactions that resulted in revenue of over $100 million to the firm. The SEC further asserted that not only did JPMorgan employees violate the FCPA by conducting the hiring program, but that employees fully understood that the hiring of such individuals for the express purpose of obtaining or retaining revenue was a violation of the FCPA. As stated in the Administrative Order, during the compliance and legal review steps of the hiring process, in order to conceal the scheme, JPMorgan investment bankers and other personnel regularly withheld pertinent information or submitted inaccurate or incomplete information. Of the roughly 200 candidates submitted through the Client Referral Program, none were denied employment by the legal or compliance departments. JPMorgan engaged in a systematic bribery scheme by hiring children of government officials and other favored referrals who were typically unqualified for the positions on their own merit…. JPMorgan employees knew the firm was potentially violating the FCPA yet persisted with the improper hiring program because the business rewards and new deals were deemed too lucrative. The misconduct was so blatant that JPMorgan investment bankers created “Referral Hires vs Revenue” spreadsheets to track the money flow from clients whose referrals were rewarded with jobs. The firm’s internal controls were so weak that not a single referral hire request was denied. For the FCPA violations, the SEC fined JPMorgan $105,507,668 in disgorgement, with an additional $25,083,737 in prejudgment interest. JPMorgan was also expected to pay $72 million to the Department of Justice and $61.9 million to the Federal Reserve Board of Governors.